Another USDLA item for today. 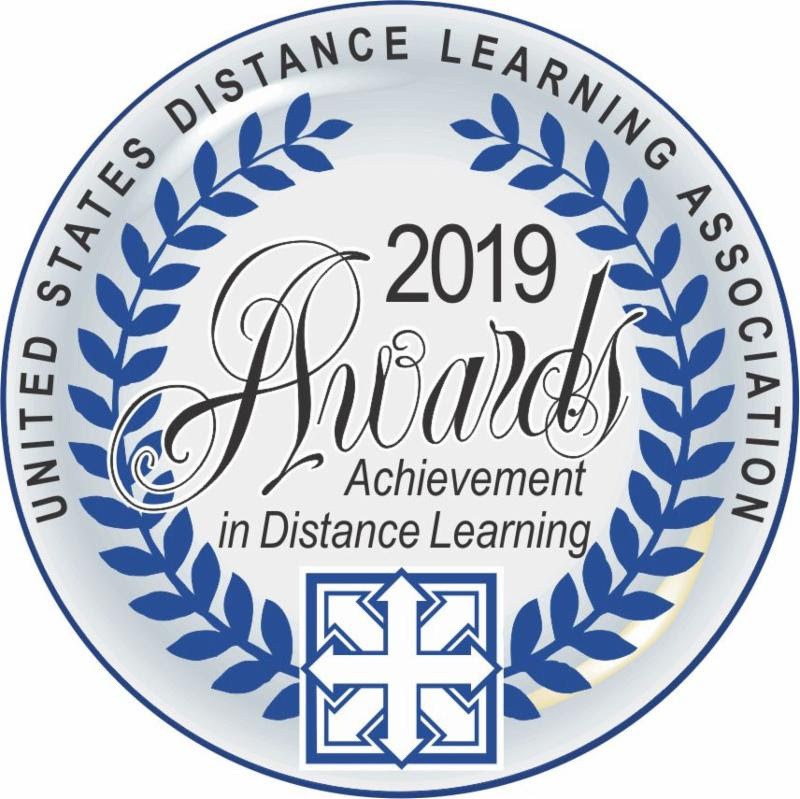 Last Call for 2019 USDLA Awards! Subject: Call for Awards will be closing this Friday at Midnight. Please be sure to complete any draft submissions and hold on to your confirmation email. This is a great way to recognize your institution and share your success with the Distance/Digital Learning community. I wish you luck with your submission and hope to see you in Nashville this May. Please forward this USDLA information to anyone interested. Subscriptions are available by clicking on the link below or visiting USDLA.org at no cost. You’re receiving this email because of your relationship with USDLA. I received this late last week from a colleague in Australia. I emailed you last year to let you know that I cited your work “Helping to make online learning less isolating” in my book Design of Technology-Enhanced Learning – Integrating Research and Practice. Well, this is just a follow-up to let you know that the book recently won the Association for Educational Communications and Technology Design and Development Outstanding Book Award. This volume does the best job of pulling together knowledge in the field toward textured but practical guidance. Bower does not overstate what is known or veer into theoretical determinism. The content is excellently grounded in theory and provides excellent examples from practice. It is very well-structured and well-written. Impactful! Faulty could use this as a foundational text in a course for technology for teachers and even for college faculty. So thanks once again for the excellent contribution that your high quality research made to this volume. As a result of the award my publisher has decided to reinstate the 30% discount, which is available to you, your library and your students by going to http://bit.ly/DesignOfTEL and typing in the promo code EMERALD30 at checkout. As well, if you are one of the growing number of academics who are deciding that they would like to use the book as the required reading in their undergraduate or postgraduate courses, please let me know so I can provide you with access to the ancillary teaching resources. So check out this volume that you can now order at a discount. Notice of this award came through my inbox yesterday. Note the deadline is still a ways off yet. We hope that you submit a nomination for the K-12 Online and Blended Learning Promising Scholar Award (self nominations welcomed). This award is based on a rigorous review and is in recognition of an unpublished manuscript that demonstrates excellence in the area of K-12 online/blended education. The award recipient will be recognized at K-12 Online Learning SIG meeting during the SITE Conference and the manuscript will be published in the Journal of Online Learning Research (JOLR) pending review. All submissions should be sent to Jered Borup (jeredborup@gmail.com) by December 1, 2018. Dear Colleagues,Each year, iNACOL honors and celebrates education pioneers for their work in personalized, competency-based education. Nominations are now being accepted for the 2018 iNACOL Innovator Awards, which will be announced at the iNACOL Symposium in Nashville, TN, which runs October 21-24, 2018. Additional information, including eligibility requirements and nomination forms, is available on the iNACOL Innovator Awards page of our website. Please submit a notice of your intent to nominate by 8 p.m. ET on August 31, 2018. Final nomination packages are due by 8 p.m. ET on September 7, 2018. Please send all intents to nominate and any questions to awards@inacol.org. Nominate a #teacher #edleader for #iNACOL18 Innovator Awards! @nacol is now accepting applications: http://ow.ly/kxXG301ws3e – Click to tweet. iNACOL is now accepting applications for @nacol Innovator Awards! Nominate a #teacher or #edleader here: http://ow.ly/kxXG301ws3e – Click to tweet. We look forward to seeing you at the iNACOL Symposium. Readers of this blog may be interested in submitting an application for one of these awards. Date limite: 1er septembre 2018. Les projets à vocation éducative peuvent être portés par tous types d’organisations. Le concours Trophées du numérique, organisé par l’Université TÉLUQ, s’inscrit dans le thème du colloque CIRTA 2018 : « Présent et futur de l’enseignement et de l’apprentissage numérique ». Ce concours met en lumière des réalisations qui favorisent ou améliorent les apprentissages de gens de tous âges et de toutes situations. Les projets récompensés ont des objectifs pédagogiques et allient usage de technologies, outils et approches numériques. Le concours est ouvert à tout projet alliant l’usage de technologies, d’outils ou d’approches numériques avec des objectifs pédagogiques. Le projet doit viser à permettre, à favoriser ou à améliorer des démarches d’apprentissage au bénéfice d’apprenants de tous âges et de toutes situations. – Des entreprises (pour des activités de formation vendues ou organisées pour leur personnel). – Les projets soumis doivent être dans une phase de mise en œuvre de moins de 24 mois, de façon à permettre un retour d’expérience.